Sign up at janice@wildsouth.org or 256-974-6166. Advance registration is required in order to limit group size. Include your phone number, please. Caney Creek is a summertime dream come true. 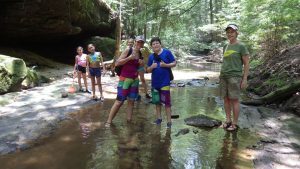 Join Wild South staff on a hike to both upper and lower Caney Creek Falls. The two waterfalls on Caney Creek are connected by three quarters of a mile of canyon stream flowing its way to the Sipsey Fork. A one-mile walk from the trailhead on Winston County Road 2 brings us to the first waterfall and one of the best swimming holes in Alabama. We will continue to explore downstream to the second waterfall. The hike into the canyon is mostly on an old road that has turned to un-maintained trail. The final descent into the canyon is quite steep, as is the climb out on the way back. For most hikers, this is the most challenging part of the hike, the steep beginning of the walk out. Be prepared for the heat by dressing for the weather. Footwear should be sturdy and protective with good tread for traction on steep slopes, uneven footing, slick rocks and creek crossings. There will be several creek crossings. There will be ticks. We recommend Repel or Sawyer’s with permethrin, the kind of repellent that you spray on your clothes and not on your skin. It really works. Spray clothing about 4 hours in advance so it has time to dry. The best part is that it has no scent! After signing up, meet the group at 9:00 a.m. at the Wild South office (see map link above). If it makes more sense for you to meet the group at the Caney Creek trailhead, please let us know when signing up.